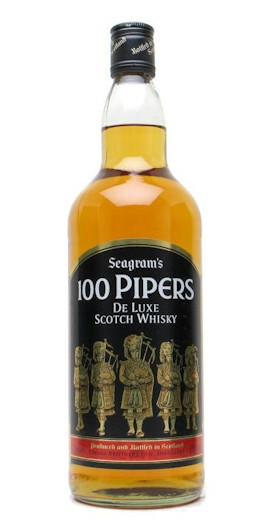 100 Pipers Blended Whisky is a very famous blend from Seagrams which has lately become known by the name 'Black Watch'. This bottle is from the 1970's. The standard bottle of 100 Pipers is popular throughout the world and is growing in status with even non whisky countries taking supplies of this whisky. The name comes from the 100 pipers who went with Bonnie Prince Charlie, into battle. The blend itself contains around 30 top quality Scottish whiskies. The name De Luxe is only used in a few Scotch whisky blends and this is one of them and just show the standing it has within the whisky industry. The whisky is of a dark golden colour with a medium body. The taste is a mellow with a sweet taste. The finish is of a smokey and sweet nuttiness. Distillery details regarding 100 Pipers Blended Whisky. 100 Pipers is stored in the Scottish Highland where it is left slowly maturing over the years to give it the taste that we know before this amazing blend hits the shops.